In Afrin, Syria, located 40 miles north of Aleppo, the leaders within the Women’s Protection Units (YPJ) continue to recruit new women to fight against the Islamic State (ISIS/ISIL). “We learn how to use weapons and we take military education classes,” explained Rozelin, one of the latest recruits. “The YPJ battalion’s actions have shown the entire world that women are able to effectively fight to the end and get the better of Daesh militants,” said commander Servin Rojava. The YPJ captured international attention when the Islamic State barreled through Iraq and Syria to establish their caliphate. Rojava said the government formed the YPJ on April 4, 2013, to protect the Kurds in northern Syria. The group consists of Assyrian, Arab, and other foreign women. Women are very important on the battlefield against ISIS. The jihadists are difficult to defeat for men because many seek to die in battle. They believe when they die, Allah will reward them with 72 virgins in heaven. However, if a woman kills them, the men are denied their virgins in the afterlife. Last month, a group of 50 Syriac Christian females picked up arms and fight against the Islamic State (ISIS/ISIL). Babylonia, 36, left her two children and job as a hairdresser. “I miss Limar and Gabriella and worry that they must be hungry, thirsty and cold. But I try to tell them I’m fighting to protect their future,” she said. The 50 females graduated from a training camp in Al-Qahtaniyeh, located in northeast Syria, to join the “Female Protection Forces of the Land Between the Two Rivers,” referring to the Tigris and Euphrates (ancient Mesopotamia). The town is historically associated with the Assyrians, with a population of just under 20,000. The Kurdish People’s Protection Unit (YPG) took control of the city in July 2012. In Iraq, famous Yazidi singer Xate Shingali formed an all-female brigade in August. Shingali, 30, received permission from the Kurdish president to form the “Sun Girls” battalion on July 2. Over 123 women between 17 and 30 signed up to battle the brutal terrorists. 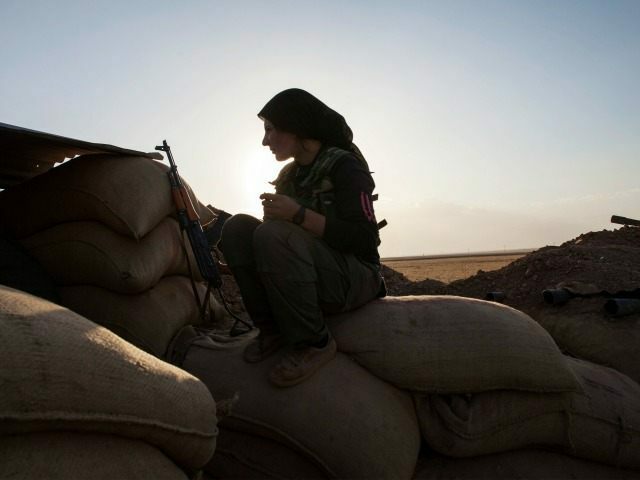 The male Kurdish fighters train the women with AK-47s. “We have had only basic training and we need more… But we are ready to fight ISIS anytime,” declared Shingali.